Today, our Legal Director, Ron Fein, penned an op-ed in Newsweek with Julian Schreibman, a New York attorney, served at the Central Intelligence Agency. 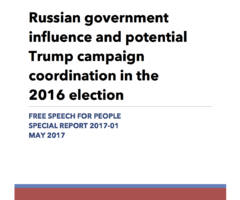 Fein and Schreibman say “follow the money” if you’re asking if the Trump campaign colluded with Russia. 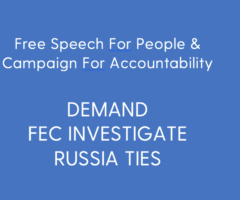 FSFP and the Campaign For Accountability filed today an amended complaint with the Federal Election Commission demanding “an immediate investigation” into whether the Russian government illegally spent money to influence the 2016 presidential election, in possible coordination with the Trump campaign.